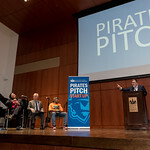 Hundreds of students, faculty and friends cheered on four student teams who pitched their business ideas for $16,000 in venture capital seed funding at the ninth annual Pirates Pitch Startup Contest sponsored by the Stillman School of Business' Center for Entrepreneurial Studies. 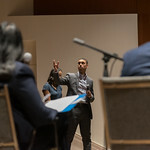 Urged on by John Fanta '17 from Fox Sports Network and Big East Digital Network, who served as Master of Ceremonies for the April 3 event, the audience and investor-judges drilled down on what would make each potential business a success. 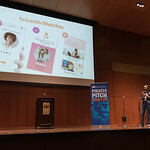 All teams received seed funding for their projects, with M.B.A. student Alissa Lopez, taking home the largest amount at $9,000 for Sincere Sitter, a website and app connecting caregivers and parents. 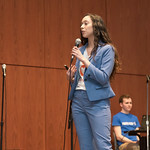 With more than seven years experience as a babysitter, Lopez wowed the judges with her idea and business plan. 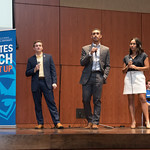 Just last month Lopez's idea led to her being selected as one of the final eight teams to pitch at the Student Startup Madness Entrepreneurial Competition at the South by SouthWest festival in Austin, Texas. College of Nursing freshmen Allison Lamoureux, Katie Mazzarelli and Annemarie Ryan pitched Care Call and received $3,500. 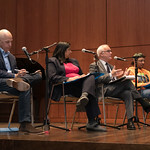 They worked closely on the project with a support team comprised of of Patricia Esposito, Isabel Finan, Gary Kraft, Julia Skerratt and Isabella Valentino. "Easy, efficient, effective," Care Call would allow patients to communicate their exact needs to nurses through tablets and software, alerting the nurses to the specific nature of the concern. The goal is to reduce wait times, improve nursing procedures and increase patient satisfaction. The Care Call team, all members of the Nursing Cohort in the new Buccino Leadership Institute, also received the Audience Choice Award, earning an additional $500. The student team of Peyton Elder and Olivia Finan from Flock were awarded $2,000 for their multiplatform application that would allow consumers to easily compare the food prices and wait times for popular food delivery services such as Uber Eats and GrubHub. Steven Catudal, Elizabeth Win and Nathanael Boatswain were awarded $1,500 for their business idea Sprouts Analytics, which aspires to be the Bloomberg Data Service for cryptocurrencies, providing real-time data, news feeds and user forums. 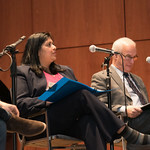 Susan Scherreik, founding director of the Center for Entrepreneurial Studies, expressed her excitement about the event and the fearless nature and creativity of this group of student entrepreneurs. 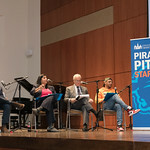 "The goal of Pirates Pitch is to cultivate the ambitious drive of student entrepreneurs and assist those young professionals in making their ideas a reality," said Scherreik. 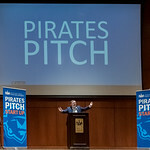 "Each year, Pirates Pitch continues to grow and develop as a competition. 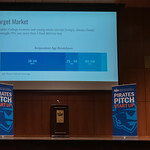 That growth is a reflection of both the limitless creativity and ingenuity of Seton Hall students and the planning and support of all those involved." During the competition, the judges shared how impressed they were by the caliber of the students' ideas, the effort put into the business plans and the polished presentations. 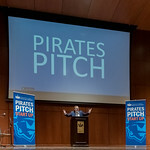 "Pirates Pitch is a phenomenal way of encouraging the entrepreneurial spirit of students at Seton Hall," said Raghavan. "It introduces the young entrepreneurs to a network of experienced individuals who can provide valuable feedback that can take the ideas to the next level." "This competition gives students the opportunity to formulate a business idea and have that idea manifest into a start-up," said Auriemma. "The lessons that these teams learn from this experience will grant them a competitive advantage in their industries for years to come." Alumnus and former Pirates Pitch winner Christian Zeron '16 advised the competitors and aspiring entrepreneurs on the importance of understanding the "why" in business. He shared that finding purpose in one's work gives direction goes on to influence actions and choices for the business. Zeron's vintage watch business, Theo and Harris, cracked $2 million in sales last year.